A Little News and a Winner! Good morning – and, depending on where you are, good afternoon, good evening, and goodnight! 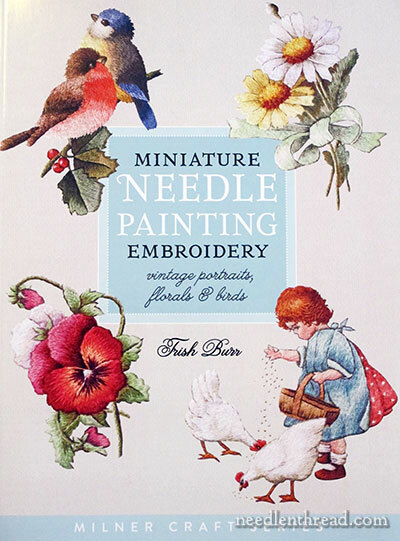 Well, today I’m announcing the winner for last week’s give-away of Trish Burr’s new book, Miniature Needle Painting Embroidery, which I reviewed a couple weeks ago. And then I’ll regale you with news, in case you want a little browse over your coffee. I’ll tell you another little secret about me. I write my articles from my bedroom. Yes, my bedroom and office are one. It’s a dangerous situation. I have to make my bed right after I crawl out each morning; otherwise, it becomes a Siren, luring me to the Pillows of Self-Destruction. Right now, the sun is not up. The lure is strong. The winner, drawn randomly, is Nupur Heise! Nupur is an avid stitcher and she blogs about her stitching adventures over at Song of My Needle. You might remember her beautiful embroidered monogram that I shared with you a while back. This was Nupur’s answer to the question, What grabs you most in Trish’s book? If you’ll drop me a line with your mailing address, Nupur, Miniature Needle Painting will wing its way to you shortly! These are affiliate links below, meaning that Needle ‘n Thread gets a small kickback if you order the book through the link. Miniature Needle Painting Embroidery is available now through Amazon here in the US. It surprised everyone and was released a little earlier than planned! Worldwide, you can find Miniature Needle Painting Embroidery through Book Depository, where it hasn’t yet been released, but will be shortly. A long time ago, I reviewed for you this Royal Persian Blossom crewel embroidery design from Talliaferro. Well, Rose Andreeva, a fellow embroiderer in Russia, is embroidering the design in silks, and it is gorgeous! Pop over here to her blog, Roniy Stitch, and click on the photo for a large version. It will delight you! If you live in the Boston area (under mountains of snow), you might want to embroider this particular fellow. Maybe it will turn things around! You’ve got to admit – it’s really cute! Hey! Jen Goodwin is offering an online blackwork class for her peacock design. Good for her! If you’re in the UK, it’s probably a bit more affordable. If you’re in the US, don’t forget the currency exchange rate and overseas shipping. I just calculated shipping to Kansas – the class with the kit ends up being about $245 US. Tomorrow, I’ve got a nice collection of tips for you, for accomplishing a sensational satin stitch. Ok, that’ll do it for this morning. The sun is up! You’ve revived me! The daily adventure awaits! August 30, 2011 Needle Painting Embroidery Book – Winner Announced! Good Morning Mary, Thanks for sharing this book with us. I received my copy yesterday. I am so excited to learn some new techniques. I just love these small projects. Thanks for the links, Mary. That snowman sure is cute. Now that I know you work from your bedroom, my respect for you has climbed several notches. (And it was already pretty high). The number of distractions in a bedroom would make it near impossible for me to work. I tip my hat to you, Mary. Congratulations to Nupur I hope you enjoy the Miniature Needlepainting Embroidery book. I have the Royal Persian Blossom crewel embroidery design I remember your review and I love Roniy embroidered piece it is absolutely beautiful I love that she has embroidered the design in silks and love the colours she has chosen. Thanks for the opportunity of winning the give-away book and for sharing the newsy bits today very interesting. I hope you made your bed? have a great weekend. Yes, Mummy, the bed is made! 🙂 LOL! Well, it’s more or less thrown together, anyway. But I do have a stack of books on the floor… I will put them up now. And congratulations Nupur. I know you’ll delight with the pansies you’ll complete. Mary, you could always call the bedroom your office! Now, there’s a point I hadn’t considered. And how many people are lucky enough to have a comfy bed in their office?!? Why didn’t I think of that! I used to work in my bedroom. Now I am parked at the kitchen table. You are right the bed was so tempting to take a pause and a nap. Now I find myself drawn too easily to the fridge and nagged by the dishes, the sweeping, the mopping. But I am easily lured. My inbox as a transcriber is empty at the moment and here I am dipping in to catch up with you. Somehow I missed the passion flower until now and that led to a little spate of memories of my dad growing them and now I have shared both a flurry of photos of passionflower from a photo blog and explained that your needle n thread blog was the inspiration. I hope it leads my relatives and friends to you. Maybe I would accomplish more if I could corral some friends for an embroidery evening now and then. LOL. Keep your toes warm and rejoice in the bedroom office in this weather. Thanks for your work. An embroidery evening sounds like a good idea, Gay! I’ve been doing computer work in my bedroom since I was in college (well, in my dorm room), so I’ve grown pretty used to it! 🙂 It would be MUCH harder in the kitchen! My copy, purchased through Amazon with the link from your review, arrived today! Thank you for recommending this beautiful book. I love Trish Burr designs and someday I will be able to stitch them too! Look forward to your blog post every morning and look forward to your project posts most of all. Thank you for all you do for us. Thanks, Norma! I hope you enjoy the book – and I hope you work some of the projects and tell us all about it!! Congratulations to Napur. Her work is beautiful. thanks a lot for taking an interest to my work.I always read your blog with great pleasure.I would like to thank you for you fun stich it always helps me !